My phone’s alarm broke the blessed bliss of sleep. Instinctively, I reached to turn to turn it off and set it back down on the stack of papers I’d been working on the night before. I curled back up and pulled the covers tight around me. The bliss evaporated within seconds. As I became fully awake, my heart sank. With deep silent sighs, I remembered — this is life now. Day after painful day lay before me. I could not imagine what my future held – it looked bleak and shapeless and anchored to . . . what? The one who had helped anchor my life for 26 years, shaped the rhythm of our day, brought steadiness and laughter and fun to our home was gone. And with him, all of life as we knew it. All of life as I’d ever wanted it. I had zero ambition to get up and meet the day. But as much as I wanted to stay cocooned in bed, the longer I lay there the more my thoughts churned with the ever-present list of things I needed to do. I needed to get kids up for breakfast. I needed to fix the mower or take it to get fixed. I needed to contact the mortgage company about a refinance. I had a list of phone calls to return from the day before. And I had seven kids that needed a mom now more than anything. I needed to pull it together to start our homeschool, to fix dinner and actually eat it at the table together, to love them through this while still doing the daily correcting, driving, listening, teaching. I willed my feet to the floor. Heading to the shower, with less than ten minutes logged into this day, I was already filled with defeat, despair and the unremitting hollow pain I would carry through my day. Every day I told God that this was too hard. Every day, I started with this thought: I CANNOT DO THIS. We can find ourselves in circumstances that are unfixable and unbearable. Unforeseen trials, huge life changes, medical crises and shattered relationships can leave us stuck and powerless. It goes against our nature to be in a place we can’t fix. We want to be able to handle things. But this is what God has wanted all along – complete dependence on Him. The first taste of complete dependence on God doesn’t usually happen by our choice but when our circumstances give us no other option. Being utterly dependent on God is absolutely where God wants us. Maybe you’re there right now? Often it’s when we feel helpless, that we see God help most. God over and over again calls Himself our helper. We may hate the circumstances that brought us to helpless dependence. But if we’re here, let’s rest in the assurance that the Sovereign God of the universe who not only created every atom of our world but sustains it in breathtaking symmetry, will be our helper when we are most helpless. This is Day 2 of 31 Days: Braving the Broken. You can read the series here. You can have new posts delivered right to your inbox. Sign up here for inbox encouragement. The broken places come without warning. There’s no alert that tomorrow about noon, we’re going to get a phone call that will change our life. No notice to get ready for a huge trial coming our way in a month. When life as we knew it collapsed under us, I found myself in completely uncharted territory. I had no idea what to expect as a young widow. I felt an immense weight of not only navigating the fallout and my grief, but shepherding seven children through their dad’s sudden death. Within a week, I had a small stack of books on grief and single parenting and suffering. I would start to read each book and the author’s story of brokenness. But I could never read straight through the books. I always turned to the final chapter, to read the end of the book. I wanted to know how the story ended for each family — whether the kids were okay and whether the author had remarried. I wanted to read that, although their circumstances had been terribly difficult, they were thriving and happy again. That’s our nature, isn’t it? We live most of our life thinking ahead to the next chapter to make sure that it’s all going to turn out for us. Will we have enough for retirement? Will our children turn out well with stable, productive lives? Will we live well into a ripe old age? Our books and films reflect this craving for a happy ending. Movies that don’t deliver a happy ending never really sit well. I cannot tell you how many times I’ve choked up reading the final pages of a chapter book to my kids as all of the mounting conflict is happily resolved. And so “will this turn out okay” is the first question that bubbles up when we find ourselves in the midst of a trial or painful circumstances. When we focus on the ending, we can miss what God is doing in the process. Before we were ever born, God ordained every single one of our days and recorded them in his book. That includes the best days — when the exam is aced; when a velveted box with a single solitaire is offered on bent knee; when the pinkest, most adorable newborn is swaddled and cradled. 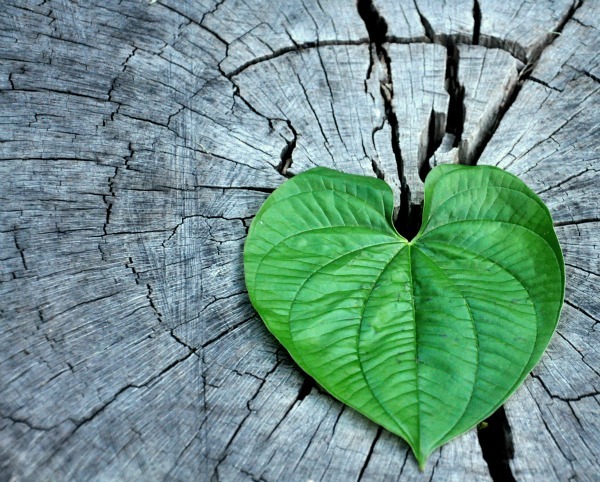 That includes the very hard days – the one where the boss comes in with news that the job will no longer be needed and you can go ahead and clean out the desk; the one where an unalarming doctor visit results in a devastating diagnosis; the one where a family is rocked to the core by a unilateral decision to leave for someone else. God has allowed all of them. Every day held in the safe sovereignty of our good and loving God. Psalm 139:16 says that God has fashioned our days, each one before we were even born. The Hebrew word for “fashioned” is used of a potter molding his vessel. If you’ve ever watched a potter work a lump of hard clay on a wheel, you know that first he must work handfuls of water into the clay. Then slowly he begins to shape the clay with his hands, pinching, pressing and removing pieces unfit for the work. He often chisels a unique design into the clay using wire tools and small knives. Even then the vessel in unusable until it’s been fired in the kiln. While we crave to know the ending – to see the finished vessel – God is about the molding. As unwelcome as the hard days are, God has allowed trials and suffering to mold us and shape us to become more like Christ. We cannot fast forward through the book. We can’t turn to a page six months from now or ten years down the road. If we keep our eyes on the ending, we’ll miss all that God is molding in us right now. Trust that God knows the ending. Trust that God has already fashioned every day between now and then. Trust that God will use this for His glory as He molds us into vessels He can use. 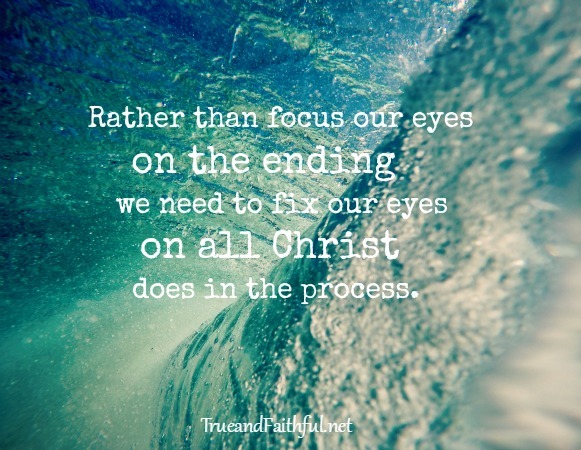 Rather than focusing our eyes on the ending, we can fix our eyes on all Christ is doing in the process. 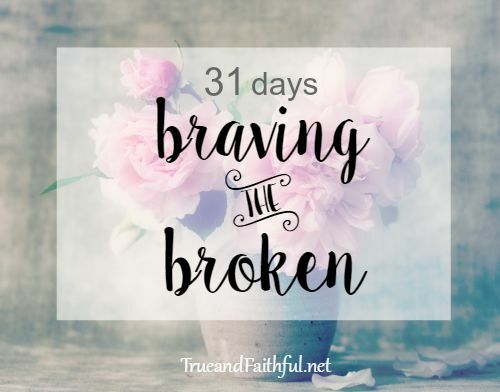 Welcome to Day 1 of 31 Days: Braving the Broken. 1) I’d love to hear from you. I’d love your feedback, what resonates with you and what God is teaching you. Feel free to comment here or start a conversation on the Facebook page here. I’ll comment back! 2) Share this with others you think might benefit from this 31 Days. You can share using one of the buttons below or invite them to sign up here.